Established in 1899 in London, the Hiram Lodge is the first liberal lodge in Britain. 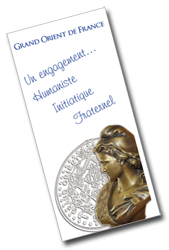 The Lodge belongs to the Grand Orient de France, and receive all the men and women who wants to work together to the improvement of the Humanity. The Grand Orient de France is the oldest and largest Masonic Order on mainland Europe. Created in 1728 as the Première Grande Loge de France, it acquired its current name and status in 1773. It thus began at the same time as the appearance of other lodges appeared (just before the French Revolution, it still included among its Grand Officers the brethren Puisieux, who had been Master of Lodges as early as 1729!). Today, the Grand Orient has 44,000 registered members in more than 1,000 lodges throughout all of mainland France, but also beyond, on every continent. It has also contributed to the revival of Freemasonry in Central and Eastern European countries. In the tradition of research and emancipation that underlies the Grand Orient de France, the Masonic initiation should transform man in all his dimensions. Even today, it promotes the principles first declared in 1738 by the brethren Chevalier de Ramsay: æººen are not distinguished essentially by the different languages they speak, the clothes they wear, the countries they live in, nor the functions they occupy. The entire world is one large Republicãƒ»Our society was first established to revive and spread these essential maxims that are part of mankindç—´ nature.ãƒ»The Freemasons of the Grand Orient were among the first craftsmen of the arrival, then the establishment in our country of the Republic, which is now such an inherent part of the French identity. They consider themselves somewhat as the protectors and avant-garde of the Republican regime, which alone can foster the full development of each and every person in Liberty, Equality and Brotherhood. The history of the Grand Orient de France is a series of actions by members who have worked to give substance to these principles. During the eighteenth century, the Grand Lodges throughout the world decided to recruit not only among Christians, but also to open lodges to men of all religions. During the nineteenth century, the Grand Orient de France went even farther by proposing the Masonic initiation to all men, provided that they respect the æººoral Lawãƒ»as stated in the Anderson Constitutions. In 1877, to remain éhe centre of the union between people who would otherwise remain total strangers,ãƒ»the Grand Orient abolished the requirement by which its members had to acknowledge the existence of God and the immortality of the soul. This was the beginning of a Freemasonry that accepted believers and non-believers, and left members completely free to pursue their own conscience and personal research. The Grand Orient considers metaphysical concepts are entirely personal. The lodges of the Grand Orient de France therefore work according to their own orientation, either under the invocation of Universal Freemasonry, or to the glory of the Great Architect of the Universe. They pursue a balanced humanistic approach between a reflection on the society and the initiatory work. From the very first, the Grand Orient de France intended to be the federating body for French Freemasonry. Up through the Second World War, in fact, it numbered nearly two-thirds of the French Masons. Today, it is the only large traditional Order to maintain friendly relations with all the other Orders, including mixed and feminine orders, to which it recognizes full Masonic legitimacy. Honed over the centuries, the symbolic language of the rites tends toward the universal and allow members to come together, far from the restrictions of everyday life and beyond usual divisions. The Masonic brotherhood, of which the lodge is the crucible, is a place of questioning and debate among well-intentioned men, regardless of their beliefs. The confrontation of differences with the aim of understanding what constitutes the unity of man is therefore one of the keys to the initiation process. The initiatory dimension is the essential tool that allows the Mason to discover a meaning to his existence and to transmit this meaning into that of humanity striving toward emancipation. In the Masonic world, the French Rite -in fact the French version of the rite of the Grand Lodge of London exported to Paris in the 1720s- is today the most widely practiced rite. But all the other rites that have marked the history of the Order: the Ancient and Accepted Scottish Rite (1804), the Rectified Scottish Rite (1776), the Rite of Memphis-Misraïm (1813) and the York Rite (1817), have all found their place within the Order during its long history. These rites are designed as tools to attain knowledge and are all now practiced within the Grand Orient.